I don’t know if you’ve noticed, but I’m a bit obsessed with cabbage lately. It’s inexpensive, healthy, and lasts a long time in the fridge. 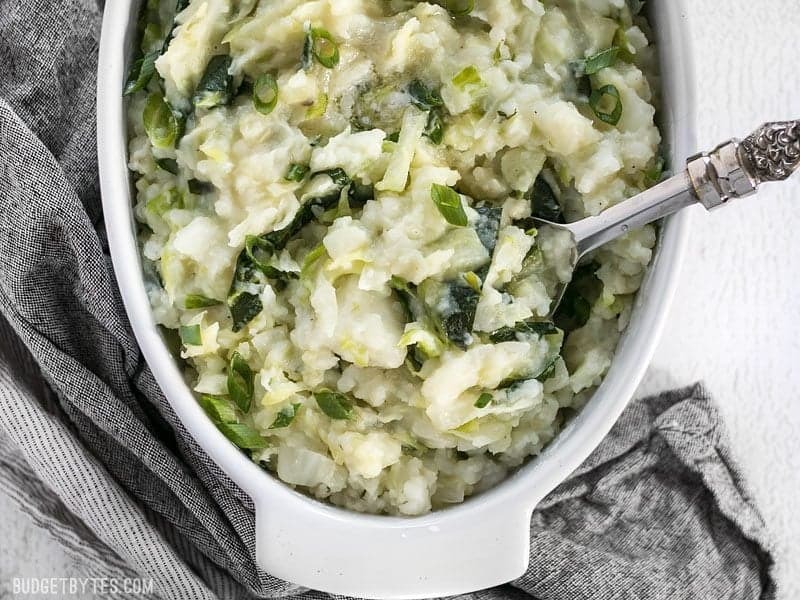 Because I always seem to have some in my produce drawer, it seemed like a perfect time to finally make colcannon, a recipe I’ve wanted to try for YEARS. 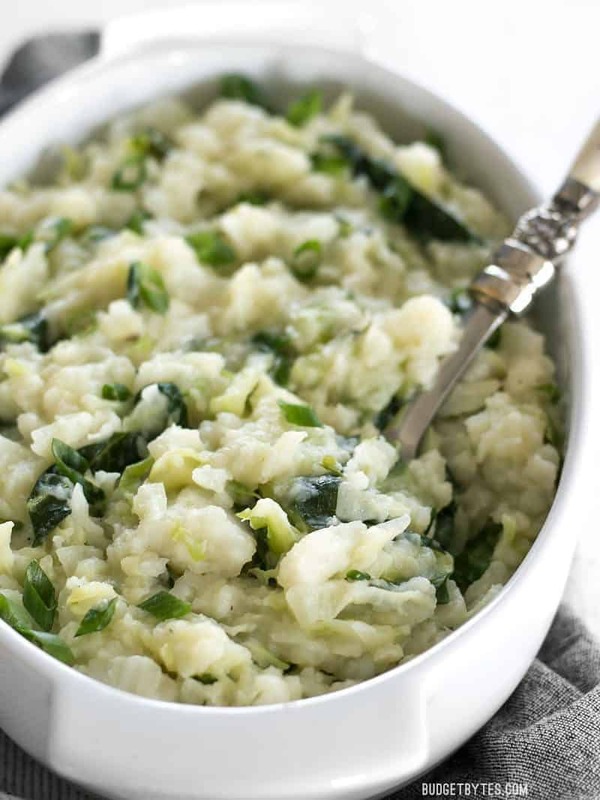 If you’ve never heard of colcannon, it’s basically the perfect Budget Byte. 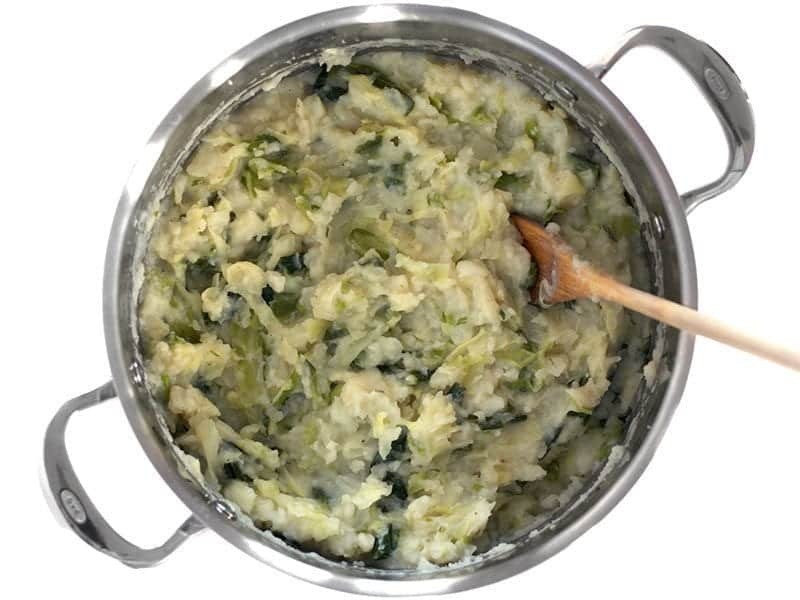 This traditional Irish dish brings together two inexpensive ingredients, (potatoes and cabbage or kale) to make a super filling and delicious dish. 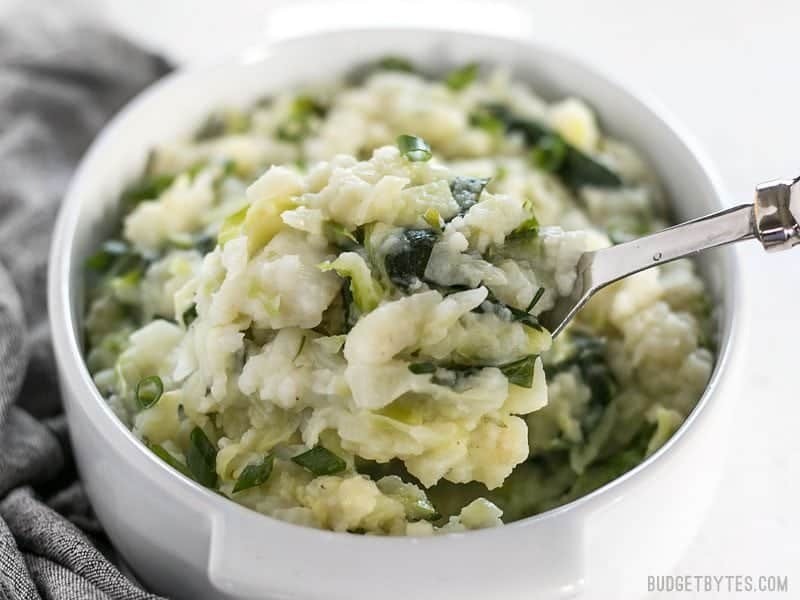 Traditional colcannon can be quite heavy with a TON of butter and heavy cream, but to fit my lifestyle I’ve lightened it up a bit. Just a bit though, because I still want it to be good! I’ve used just four tablespoons of butter (yes, that’s less than most recipes I’ve seen) and swapped cream for a mix of whole milk and chicken broth. It’s still very filling, tastes great, and I feel good about eating it every day. I used cabbage for my colcannon because it was super inexpensive this week ($0.29/lb. YAY! ), but you could mix in just about any green that you have in your fridge. Kale, spinach, collard greens, leeks, whatever! That’s what makes this recipe great. 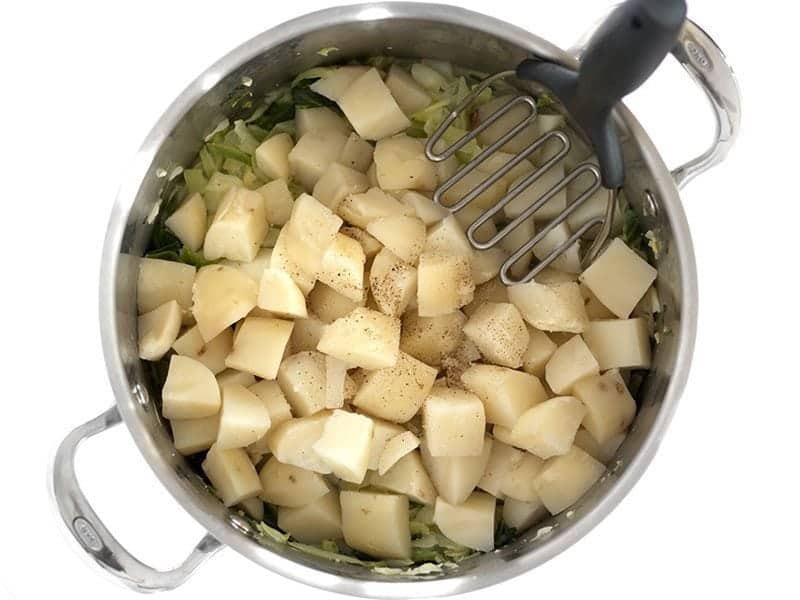 It’s very flexible so you can adjust the proportions of potatoes, greens, butter, or milk to work with what you have on hand. I keep thinking about how awesome other common mashed potato add-ins would be in this, like cheddar, sour cream, bacon, or even some caramelized onions. So flexible! 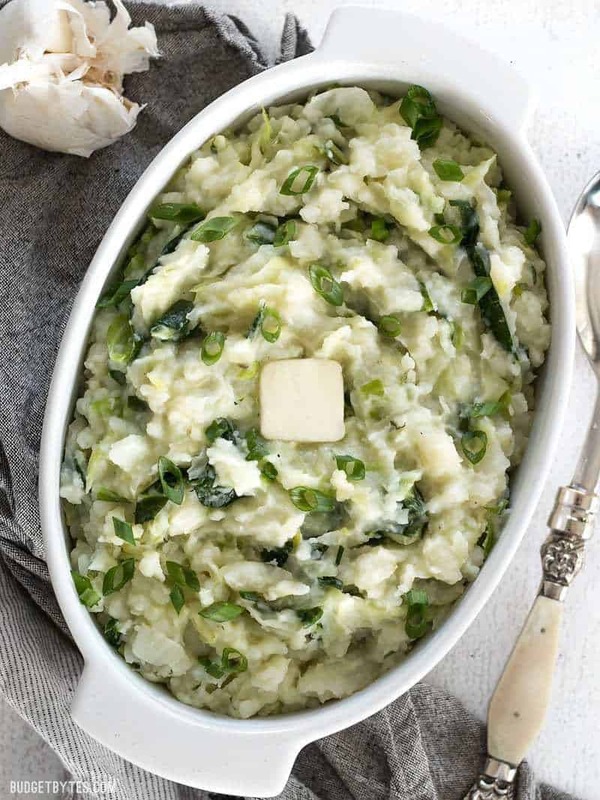 Colcannon is a simple Irish recipe that combines two hearty but inexpensive ingredients to make a delicious and filling side dish. 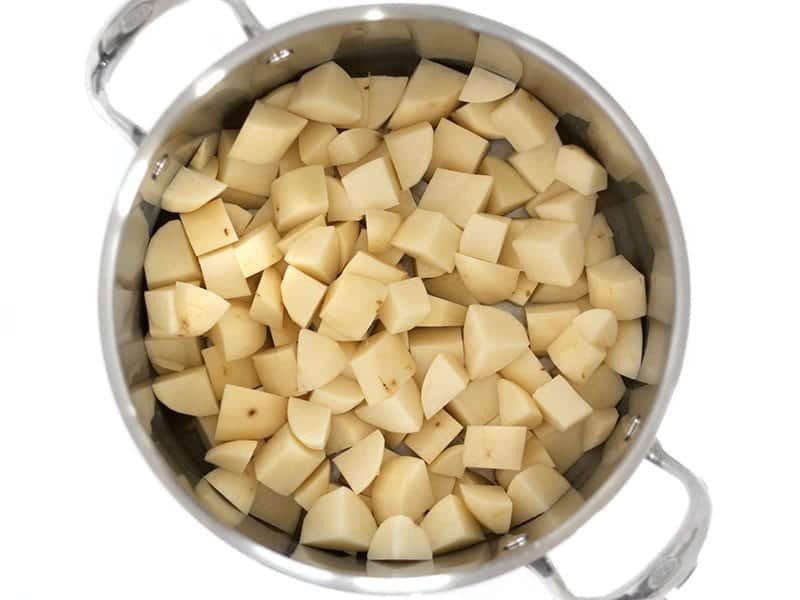 Wash, peel, and cut the potatoes into one-inch cubes. Place the potatoes in a large pot, cover with water, and bring to a boil. Boil the potatoes until they are very tender and fall apart when pierced with a fork (about 10 minutes). Drain the potatoes in a colander. While the potatoes are cooking, prepare the cabbage. Remove any damaged outer leaves, then cut it in half. Cut the cabbage into quarters, then remove the core. Cut each of the two quarters used in half once again, then cut crosswise into thin strips. 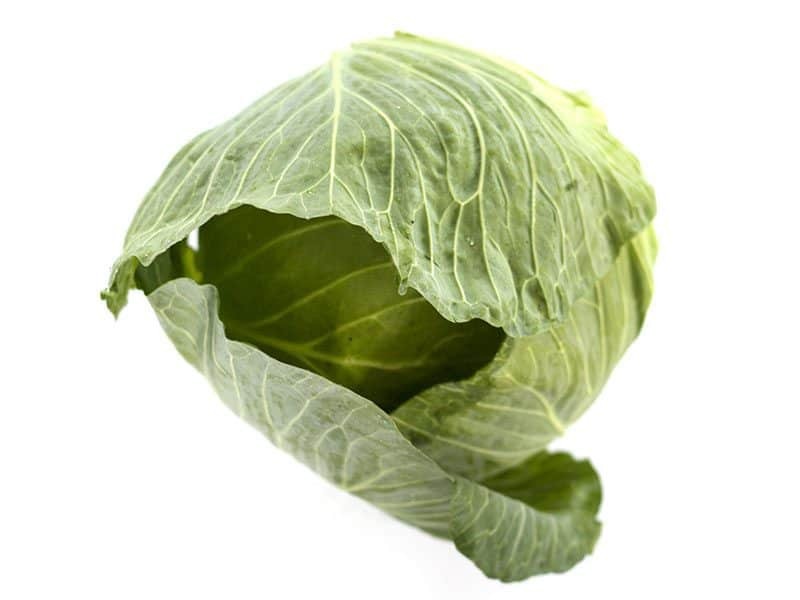 Wash the cabbage well to remove any dirt or debris. Also mince the garlic and slice the green onions. After removing the potatoes from the pot, add 4 Tbsp butter, the minced garlic, and the sliced green onions (I reserved a few to sprinkle over top at the end). Sauté the garlic and onions over medium heat for 1-2 minutes, or just until the garlic begins to soften. Add the shredded cabbage and chicken broth to the pot. Place a lid on top and let the broth come up to a boil. 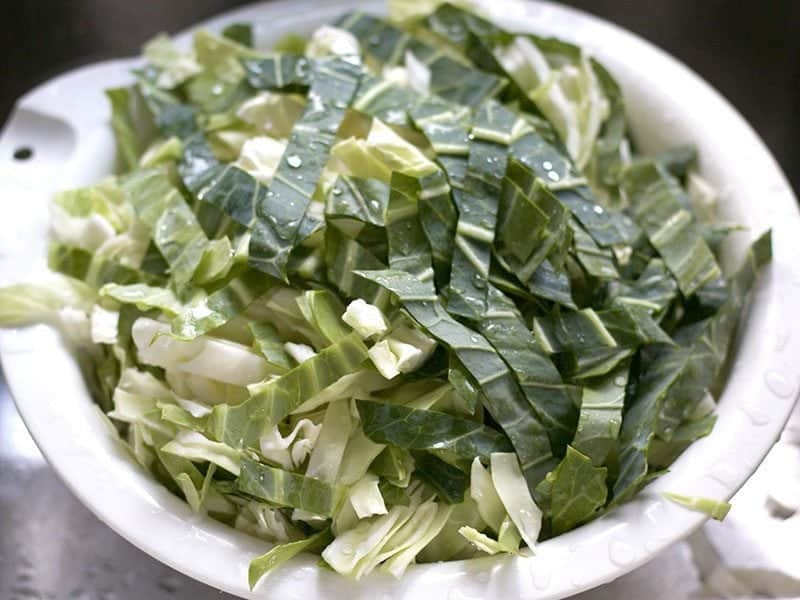 Let the cabbage cook in the simmering broth, stirring every few minutes, until it has wilted and become tender. The volume of the cabbage will shrink quite a bit as it cooks. Cook until the thicker white pieces begin to become transparent (about 10-12 minutes). Once the cabbage is tender, add the drained potatoes back to the pot along with the milk and some freshly cracked pepper. Mash the potatoes until everything is well combined. Season with salt to taste. Serve warm. This makes a huge batch, but it holds up well in the fridge. I haven’t tried freezing it though, so if you have let me know how it holds up in the comments below! Love mashed potatoes? 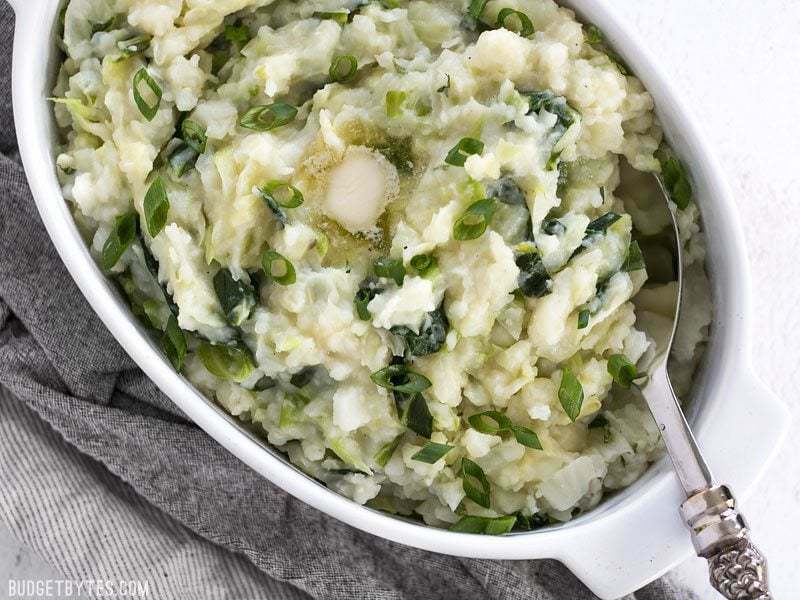 Try my Fluffy Garlic Herb Mashed Potatoes! Start by washing, peeling, and dicing 3 lbs. russet potatoes into one-inch cubes. Place the cubes in a large pot, cover with water, then bring it up to a boil over high heat (with lid). Boil the potatoes until they are tender and fall apart when pierced with a fork (about 10 minutes). Drain the potatoes in a colander and set them aside until you’re ready for them. While the potatoes are cooking, prepare the cabbage. It’s best to use a cabbage with a fair amount of green on it, but you can also add in kale, collard greens, spinach, or just about any other green you have. I used half of this big head of cabbage, which was about 6-8 cups once shredded. Cut the cabbage in half, then into quarters. You’ll only need two of the quarters, so save the other two for another recipe. Cut out the core, then cut each quarter in half again. Cut the wedges crosswise into thin strips (about 1/2-inch wide). Wash the cabbage well. Don’t worry about removing the excess water, that will just help it steam and wilt. Mince two cloves of garlic and slice four green onions. Once the potatoes have been removed from the pot, add 4 Tbsp butter along with the garlic and green onions (I saved a few of the green onions to add on top before serving). 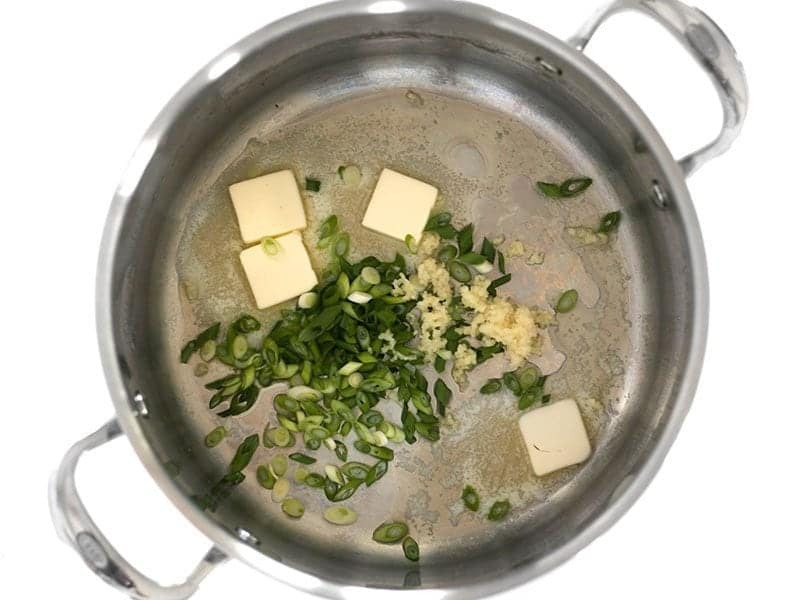 Sauté the garlic and green onions in the butter over medium heat for 1-2 minutes, or just until they begin to soften. Then add all of that shredded cabbage and 1/2 cup chicken broth to the pot with the garlic and green onions. The cabbage will likely fill the pot before it’s cooked, but it shrinks down quite a bit as it wilts. Place a lid on the pot and let the broth come up to a simmer. 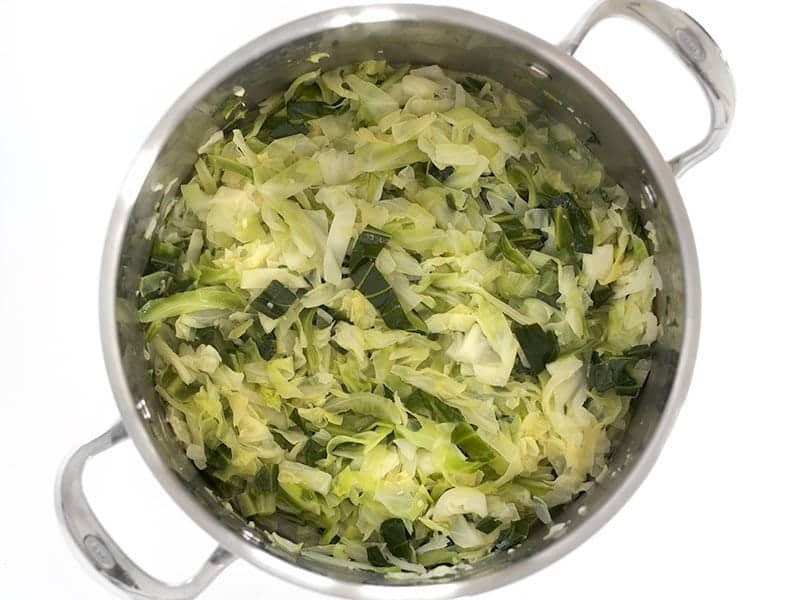 Cook the cabbage in the simmering broth, stirring often, until it’s wilted and tender (about 10 minutes). 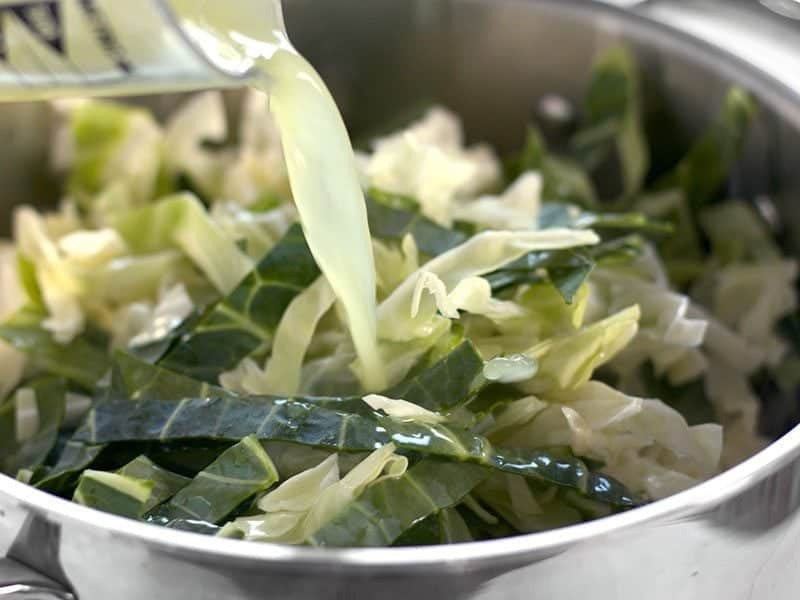 Make sure the thicker white pieces of cabbage begin to look transparent. This is what the braised cabbage looks like once it’s tender. It’s probably about 1/5th of the volume that it was when fresh. Finally, add the cooked and drained potatoes back to the pot along with 1/2 cup milk and some freshly cracked pepper. Mash everything up until it’s well mixed and the potatoes are well mashed. And now the most important step, season with salt to taste! And then the colcannon is ready to serve. I can’t think of a better way to up the nutritional content of mashed potatoes! Colcannon is definitely my new go-to. I like to build bowls with this as the base. A scoop of colcannon, some cooked chicken, and whatever else might be in my fridge (cheese, leftover vegetables, sauerkraut, or corn kernels). Goes great with steak, too! Yesterday we had potluck after our Celtic Celebration at our church. Since it was an Irish theme I asked Siri for an Irish vegetable dish and this recipe popped up on my iphone. It was a big hit with 2 requests for the recipe!! Thanks! This is a Keeper! I loved this dish but had to make a few adjustments – no green onions so I used sweet white onion; only had a small amount of cabbage so chopped up and added book choy – wow, fabulous taste; used low salt chicken broth for boiling greens and threw in left over mushrooms; added half teaspoon of horseradish to the potato with the butter. I feel I did justice to my Waterford ancestors by making this – and I will make it again and again. Thanks for the inspiration. Easy recipe & inexpensive ! It turned out great! I finally made this this weekend. I made it with pork chops and gravy and will diffidently be making it again. I have been following your blog for a couple years and I can’t think of anything I haven’t liked. Thank you for this easy to follow, great recipe. My family loved it!